Works great. Works great on orange canvas bumps. You definitely know when your dog catches this scent. Perfect product, excellent service. I will always use gundogsuppy.com for my equipment. Thanks guys. "The scents and training dummies are great"
The scents and training dummies are great. Pudelpointers are not natural retrievers, and my dog is excited to retrieve now. More excited about this dummy than regular bumpers. "IT'S A PRETTY GOOD VALUE"
WORKS GREAT WITH THE INJECTOR & DOKKEN'S DEADFOWL TRAINER. A LITTLE GOES A LONG WAY SO IT'S A PRETTY GOOD VALUE. "It worked great with my dog." It worked great with my dog. "Great product, easy to use, and it works!!!" I use the duck scent for training with both training dummies and frozen teal. When training young dogs on both blinds and long marks, it is extremely important they successfully locate each and every blind or mark. This product adds realism with the scent the dog encounters in real hunting situations, and allows the dog to learn to use their nose to locate game in cover. Great product, easy to use, and it works!!! "This works great for training my 4 month old lab!!!" This works great for training my 4 month old lab!!! "Seems like this will be a good training aid." Bought to train a new puppy. Seems like this will be a good training aid. "Hide it. My dog found it and chewed it up before I could try it." Hide it. My dog found it and chewed it up before I could try it. I still have an unopened 4 oz bottle from 1982, wonder if it will still work? "with the duck scent the dogs pick them up a lot better"
I always put it on my thunder launcher dummies for many reasons, but the main one is my training buddies' dogs don't like to pick up the launcher dummies, but with the duck scent the dogs pick them up a lot better. "The dogs love working the scents." The dogs love working the scents. "your turnaround time is unbelievable"
Steve, your turnaround time is unbelievable. The scent really works. Sent dog out a double on a windy day and dog winded dokken. Don't leave in house though, had it in the basement for some training, and my wife thought something was dead down there. My training partner had it in his garage, and his wife washed all his training clothing because of the smell! This product is a good one. I have been training my pup on blind retrieves and he can find the bumper every time. It leaves a good scent trail when dragging the bumper around the yard for my pup to learn how to track. So far so good. Works well. Helps with blind retrieves a lot. Duck Scent for Dog Training - 4 oz. Dogs get more excited with scent -- your dog's nose knows it's real! 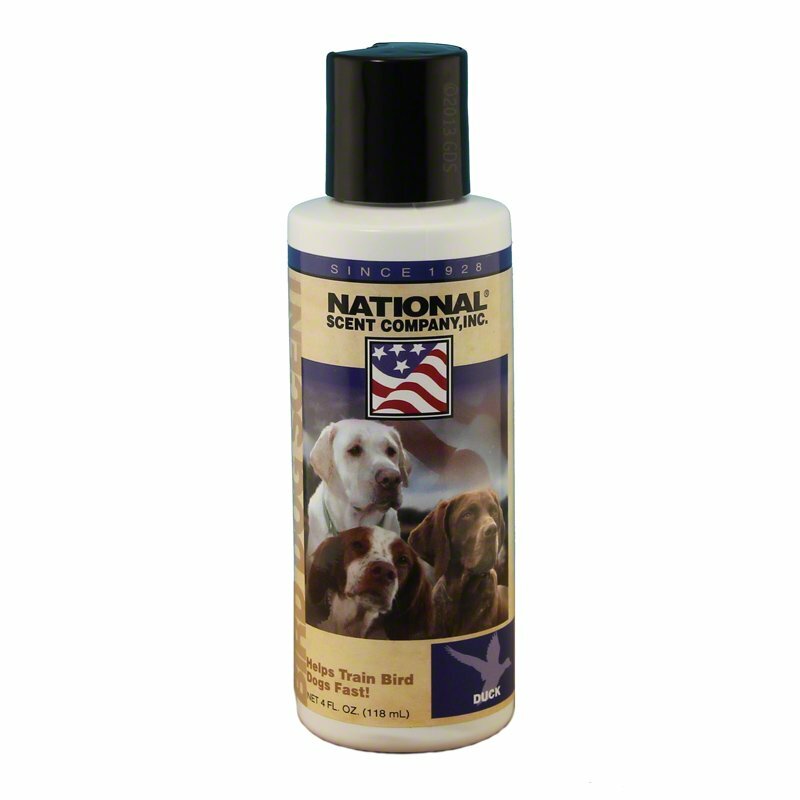 Duck Scent for Dog Training - 16 oz.